Interrarium Curators Symposium invited 30 Canadian and international curators, programmers, artists and producers to discuss the creative act of curation, including questions related to collecting, presenting, and creating context for dance and physical performance. Through the sharing of practices, visions and experiences, the Interrarium Curators Symposium was designed to foster a rigorous professional dialogue including opportunities for open dialogue, presentations, round tables, case studies, and facilitated conversations. ICS presented a rare opportunity to reflect on dance and live performance curation, and think deeply with peers and colleagues about the evolution of curatorial practice, in an arts retreat setting in the mountains of Banff, in Western Canada. 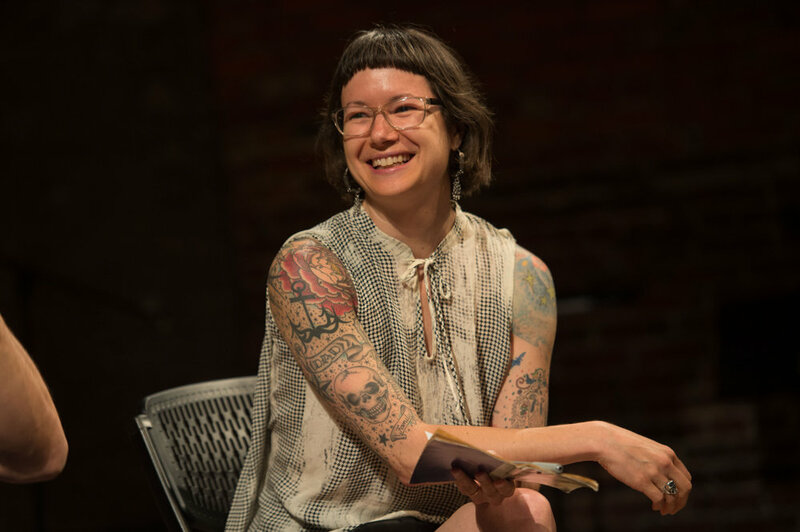 Interrarium Curators Symposium was planned in collaboration with the Springboard Performance, Prairie Dance Circuit, and The Banff Centre, with funding from the Canada Council for the Arts. ICS was designed and curated by a team of curators and colleagues interested in supporting the development of curation in Canada, including Nicole Mion / Springboard Performance, Brian Webb / Brian Webb Dance Company, Robin Poitras / New Dance Horizons and Dena Davida / Tangente Danse & ICAC CICA . Dena Davida has practiced contemporary dance for 45 years as a performer, teacher, researcher and curator. A Californian who immigrated to Montréal in 1977, she participated in the “second generation” of contact improvisers, taught Nikolais dance technique and Laban-based creative movement for children (becoming a Certified Movement Analyst). She co-founded, directed and is currently the curator of Montréal’s Tangente dance performance organization. She was also co-founder of the Festival international de nouvelle danse de Montréal. She taught dance improvisation and composition, Laban Movement Analysis, dance aesthetics and anthropology as a chargée de cours at the Université du Québec à Montréal (UQÀM) for over 25 years. Her essays and research articles have been published in numerous magazines and journals. In her twenties she completed a B.A. in theatre with a dance minor at the University of California at Riverside and Irvine, in her thirties an M.A. in Movement Studies from Wesleyan University. At age 57, she completed the doctoral Programme d’études et pratiques des arts at UQÀM with an ethnographic study of meaning in “contemporary dance events” (a case study and analysis of O Vertigo Danse’s Luna choreographic project). Her recent publications: a chapter on the founding Montréal university dance programmes in Renegade Bodies: Canadian Dance in the 1970s, and an international anthology on artistic dance ethnography, for which she was editor, with 28 dancer-researchers: Fields in Motion: Ethnography in the worlds of dance. In 2014, she initiated a long-term project to develop the theory and practice of performing arts curation with a website, an international symposium, seminal master’s level seminar and the publication of the forthcoming Curating Live Arts: Global Perspectives, Envisioning Theory and Practice in Performance. Dr. Julie Nagam (Métis - Anishinaabe/French, German/Syrian) is the Chair of the History of Indigenous Art in North America, a joint appointment between the University of Winnipeg and the Winnipeg Art Gallery. She is an Associate Professor in the faculty of History. She has recently published Traveling soles: Tracing the footprints of our stolen sisters (2017); Deciphering the refusal of the digital and binary codes of sovereignty/ self-determination and civilized/savage (2016); be polite.... because the settlers might be listening and watching (2016). Her current SSHRC funded projects include The Transactive Memory Keepers: Indigenous Public Engagement in Digital and New Media Labs and Exhibitions (www.glamcollective.ca). Nagam hosted and organized The Future is Indigenous (http://abtec.org/iif/symposia/3rd-annual-symposium/) and the International Indigenous curators exchange with Australia, Canada, Aotearoa (New Zealand) and Finland. She is co-editor of Indigenous Art: New Media and the Digital, a special issue of PUBLIC journal. She has curated and exhibited in ImagineNATIVE Film + Media Arts Festival and in 2013 she curated Lisa Rehiana’s new media installation in pursuit of venus at A-Space Gallery in Toronto, Canada. Currently, Dr. Nagam is curating a public art installation for a Reconciliation Walk at The Forks in Winnipeg, and leading a team that is creating an Indigenous App for Winnipeg’s art, architectural, and place- based history. She has co-curated with Jaimie Isaac INSURGENCE/RESURGENCE, the largest contemporary exhibition at the Winnipeg Art Gallery in fall 2017-18. Her artwork where white pines lay over the water, was shown in, Toronto, Ontario, San Paulo, Brazil, Lyon, France, Wellington, New Zealand. Her installation singing our bones home, was shown in Markham, in London, England and in Winnipeg, Manitoba. Nagam is has new public artwork, Electrical Currents for Winnipeg Arts Council, commissioned work for Nuit Blanche Manitowapow, speaking to the moon, in Toronto, Canada fall of 2017, and new commissioned work for Smithsonian’s exhibition Transformers in New York, USA, 2017-18 and The future is in the Land, a solo exhibition at A-Space, Toronto Canada. Tom Sellar is editor of the award-winning creative journal Theater and professor of Dramaturgy and Dramatic Criticism at Yale University. Under his editorship since 2003, Theater has commissioned essays, artistic dossiers, polemics, interviews, and plays from global artists and authors. His arts writing and criticism have appeared in publications including Artforum, BOMB, the New York Times, the Guardian, and the Village Voice, where he was theater and performance critic from 2001-2016. He curated the 2017 series Hidden Hate/Hidden Love with Anna Deavere Smith at the Institute for Arts and Civic Dialogue and co-curated Prelude 2016 (Welcome Failure) and Prelude 2015 (What Could We Build, or Is the Future Already Behind Us?) in New York. He has also curated for the Prague Quadrennial, Philadelphia Fringe Arts, and others. Sellar received his Doctor of Fine Arts from Yale University. Vivine is a curator, administrator, choreographer, and instructor, whose artistic goals and aspirations are rooted in the love of dance. She is the Founder and Program Director for dance Immersion, an organization that presents, produces and supports dancers and dances of the African Diaspora while providing a number of diverse programs for children and adults. As former Artistic Director and performing member of the Usafiri Dance & Drum Ensemble, Vivine created and presented works in both traditional influenced African and contemporary African dance styles. Vivine’s contributions to the field of dance are generated from an energy that has fuelled her passion leading her on a journey for over 34 years of giving and serving through the arts. Drawn to all kinds of dance expressions and movement, Ms. Scarlett’s passion has manifested many experiences that have served Canadian artists of African descent with opportunities that have laid a foundation for continued growth and representation. Vivine is the recipient of the 2011 Planet Africa Heritage Award received for her contributions. In 2008 she received a Chalmers Arts Fellowships to work with youth in Ghana, West Africa. Her choreographic endeavours in the theatre production of "The Adventures of a Black Girl in search of God" won her a Dora Mavor Moore award in 2002 and her work in "The Freedom of dreams: The Story of Nelson Mandela" received a Dora nomination in 2003. Ms. Scarlett is the 2005 K.M. Hunter Dance Artist award winner and has taught for numerous institutions and organizations throughout Canada. She continues her creative explorations as a freelance choreographer. At age 14, she saw Anne Teresa de Keersmaeker in Rosas’ Bartok and fell in love with contemporary dance (1986). At age 15, she produced her friend’s post-punk band Pestilence at the all-ages music venue One Step Beyond in Ottawa, Canada (1987). Seven people came. She knew all but one. At age 21, she studied with choreographer Deborah Hay and was forever changed (1994). Since her teen years, she has deliberately watched the TV series Law & Order, noting human behavior and gut instincts through problem solving. His professional career as a dancer started in Argentina and took him beyond Germany to Austria and The Netherlands, two countries in which he lived for some time. This quasi nomadic life has very much shaped the way in which he perceives the world. Furthermore, as a project developer and production director, he created and curated the durational performative installation KulturdifferenzTanz (Cologne, 2006), in which rehearsals with dancers from Kenya, Brazil and Germany were opened to the public together with a photographic exhibition and film projections for ten days. He co-directed and curated the Crossings Dance Festival (Düsseldorf 2006 - 2011), with the goal to challenge the social construction of the binary ability / disability, while at the same time re-framing thoughts about professionalism and contemporaneity in the arts. He has extensively moderated and chaired discussions between academics, artists and audiences in various cultural contexts (2006 - 2016). In the academic field, he finished his M.A. in International Arts Managements (Germany 2010) with the thesis Bloodbath - Blood bond. About the work of the Goethe-Institut’s cultural work in Tel Aviv. He authored the concept and curated the conference Heim. at tanz.t (playing with the German language it would mean something like Home.land dances) about body-identity politics in Sri Lanka (2014). Since 2015 I am researching for my PhD at the Centre for Dance Research, Coventry University (UK). My thesis’ working title is National Dance Platforms. A comparative study of the cases of the UK, Germany, Israel and Sri Lanka. My focus is on the narratives of nationhood that emerge out of the selection for the platforms, and the bodies and people that are thus legitimised to represent the country in these contexts. Alma Salem is an independent curator, cultural advisor and artist from Syria with 22 years of knowledge and expertise in producing hundreds of cultural projects across all arts forms. Her work has spanned international cultural relations, heritage protection , visual, digital and new media arts, performing arts, cultural policies, cultural Leadership, creative economies, industries and entrepreneurship, arts for development of communities and social change, arts in conflict, arts strategies, management, monitoring and evaluation, coaching and mentorship for artists and cultural institutions, capacity building, training and educational curricula design, arts grants management and judging and cultural translations. She is a recognized cultural expert, working with the British council from 2006 to 2015 in a variety of positions, including 5 years of leading the Middle East North Africa regional arts programmes, overseeing over 800 arts projects across 17 Arab countries—from the Levant to North Africa and the Gulf regions, to the U.K. and Europe during Arab Spring, with a co-curated exhibition entitled Syria Third Space.